Iran is seeking "many billions of dollars" in payments from the United States in exchange for the release of several U.S. hostages still being detained in Iran, according to reports by Iran's state-controlled press that are reigniting debate over the Obama administration's decision earlier this year to pay Iran $1.7 billion in cash. Senior Iranian officials, including the country's president, have been floating the possibility of further payments from the United States for months. Since the White House agreed to pay Tehran $1.7 billion in cash earlier this year as part of a deal bound up in the release of American hostages, Iran has captured several more U.S. citizens. Future payments to Iran could reach as much as $2 billion, according to sources familiar with the matter, who said that Iran is detaining U.S. citizens in Iran's notorious Evin prison where inmates are routinely tortured and abused. Iranian news sources close to the country's Revolutionary Guard Corps, or IRGC, which has been handling prisoner swaps with the United States, reported on Tuesday that Iran expects "many billions of dollars to release" those U.S. citizens still being detained." "We should wait and see, the U.S. will offer … many billions of dollars to release" American businessman Siamak Namazi and his father Baquer, who was abducted by Iran after the United States paid Iran the $1.7 billion, according to the country's Mashregh News outlet, which has close ties to the IRGC's intelligence apparatus. The Persian language news report was independently translated for the Washington Free Beacon. Six hostages have been sentenced to 10 years in prison by Iran in the past months, including the Namazis. 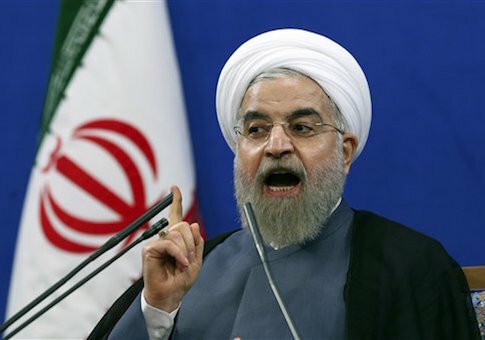 Iranian President Hassan Rouhani told NBC News in late September that his government is in talks with the United States to secure future payouts, a disclosure that may have played a role in the White House's recent decision to veto legislation to block future ransom payments to Iran. "We're currently conducting conversations and various dialogues in order to return this money to Iran," Rouhani was quoted as saying. "Perhaps these dialogues can be still conducted simultaneously on parallel tracks while we're conducting those same conversations in order to free the sums of money that are still owed to us." Sen. Mark Kirk (R., Ill.) told the Free Beacon that the U.S. is incentivizing the abduction of Americans by Iran. "I am saddened to learn of the sentencing of Baquer Namazi and his son Siamak by Iran this week," said Kirk, the co-author of key Iran sanctions laws and chairman of the Senate Banking Subcommittee on National Security and International Trade and Finance, which oversees Iran sanctions policy. "After airlifting $1.7 billion in cash ransom payments to Iran, even the U.S. State Department ‎now warns of increased dangers that the world's biggest state sponsor of terrorism will continue to illegally seize Americans and Westerners who travel or do business with Iran. Companies, banks, and American citizens would be wise to stay away from Iran," Kirk said. One senior congressional adviser familiar with the issue told the Free Beacon that Iranian officials have been pressing for another $2 billion from the United States for months. "Iranian officials including Foreign Minister [Mohammad Javad] Zarif have been bragging for months that they're going to force the U.S. to pay them several billion dollars more," the source said. "Now officials across the spectrum in Iran—from IRGC hardliners to the ostensibly moderate President Rouhani—are talking about those billions, and maybe several more, alongside chatter about the U.S. hostages." "Even some family members of the hostages talk that way, which is completely understandable given what they're going through, but it doesn't change the fact that the administration is gearing up to give Iran another ransom in the hundreds of millions and maybe again billions," the source added. Rumors of future ransom payments to Iran come as Congress continues to investigate the circumstances surrounding the $1.7 billion cash payment, a portion of which was delivered by plane to Iran just hours before it released several U.S. prisoners. The Free Beacon recently disclosed that details of this payment and other details bound up in the hostage release are being stored in a highly secure location on Capitol Hill, preventing many from accessing the documents, which are not classified but are being treated as such. The three documents show that the cash payment was directly tied to the prisoner release, adding fuel to claims of a ransom payment, according to sources who have viewed them. Iran experts who spoke to the Free Beacon said that Iran senses weakness in the United States and is angling to squeeze more money from the administration before it leaves office. "Paying $1.7 billion to Iran to release the U.S. prisoners has encouraged Iran to arrest more Americans," said Saeed Ghasseminejad, an associate fellow at the Foundation for Defense of Democracies. "Iran senses weakness in the U.S. leadership as it constantly tests the administration through a chain of provocative actions. To put an end to Iran's abduction program, the administration should make it clear, by action and not words, that it does not reward Iran for its bad behavior." Conceding to Iran's demands will only bolster the hardline regime, Ghasseminejad said. "The administration must show strength in response to Iran's other provocative actions in the region," he said. "The administration also should warn American citizens and green card holders that Iran is a very dangerous place for them to travel or do business. However, such warning contradicts the administration's continuous efforts to encourage investors and big banks to do business with Iran. The administration also should impose sanction on the entities and individuals involved in this abduction program." UPDATE 8:25 P.M.: This story was updated to include comment from Sen. Mark Kirk. This entry was posted in National Security and tagged Iran, Obama Administration. Bookmark the permalink.